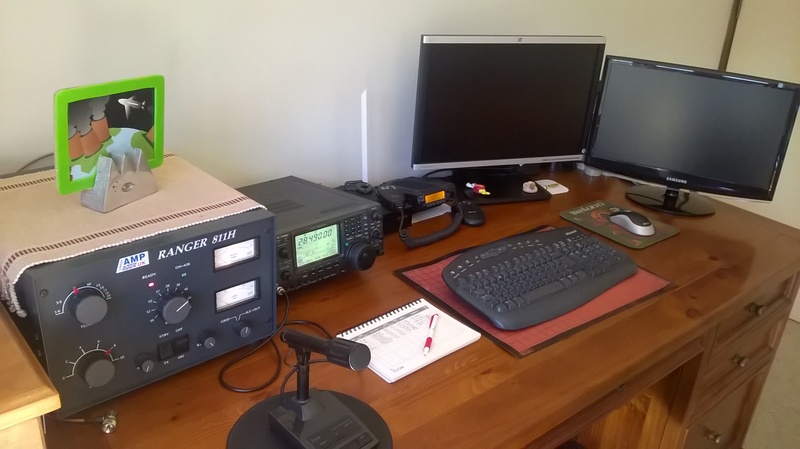 A collection of photographs taken inside and out at our Upper Beacy home QTH. 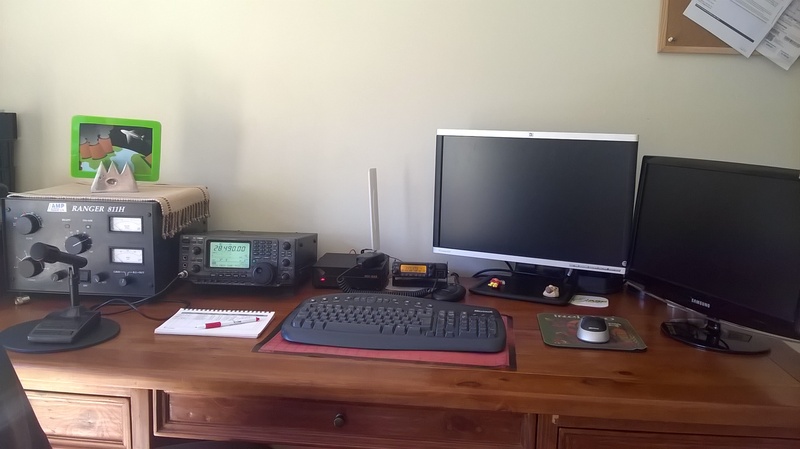 Photos taken of the shack in April 2016. Primary tower at VK3GYH. 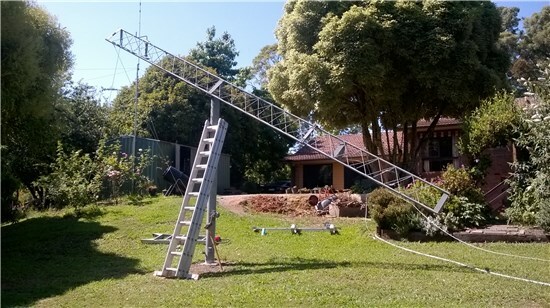 This is a Nally 13.7 meter, two stage crank-up and tilt-over tower. Optibeam OB9-5 and JK Antennas JK-65 installed. The photo shown was taken on 18/02/2018. Left: Primary tower at VK3GYH. This is a Nally 13.7 meter, two stage crank-up and tilt-over tower. Hygain TH3JRS installed. The photo shown was taken on 27/01/2017. Right: Primary tower at VK3GYH. 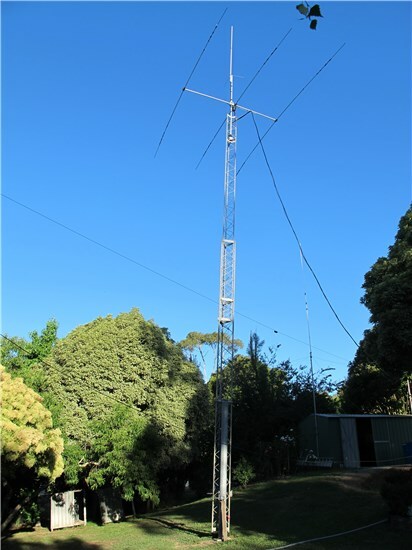 This is a Nally 13.7 meter, two stage crank-up and tilt-over tower. Optibeam OB9-5 installed. The photo shown was taken on 19/03/2017. Left: Primary tower at VK3GYH. This is a Nally 13.7 meter, two stage crank-up and tilt-over tower. The photo shown was taken on 27/01/2017. 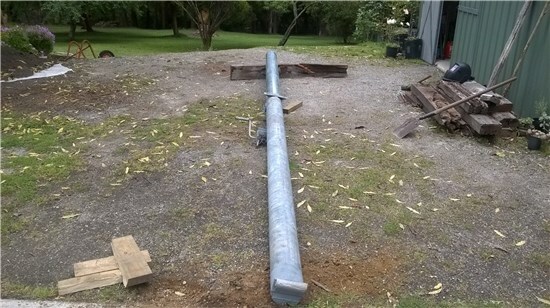 Right: This is a picture of the H.F. vertical antenna that is attached to the side of the garden shed. 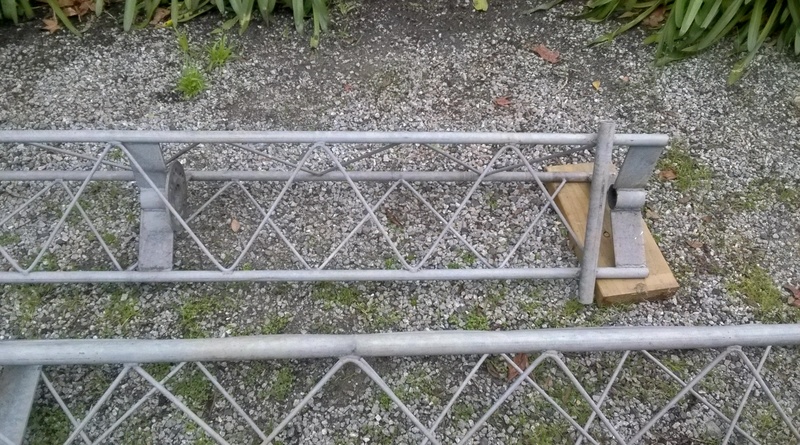 The vertical antenna covers 40-20-15-10 meter bands using a trap arrangement. 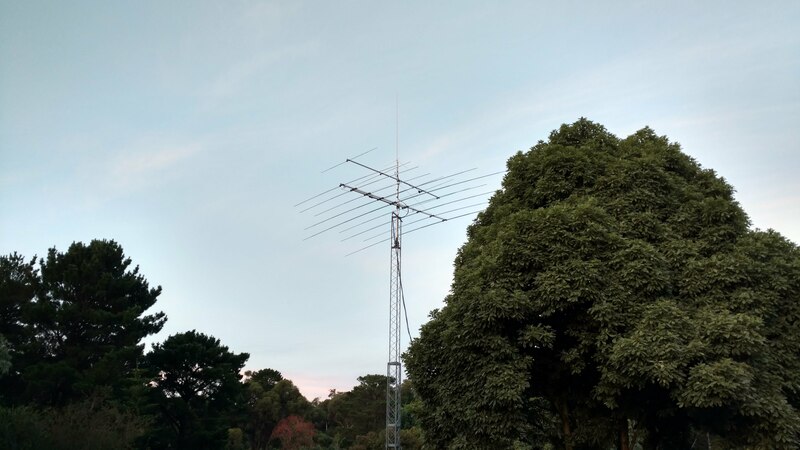 Not shown in the picture, but situated nearby is the H.F. trap dipole, this is slung between two trees in a sloping arrangement and covers 80 and 40 meter H.F. bands. 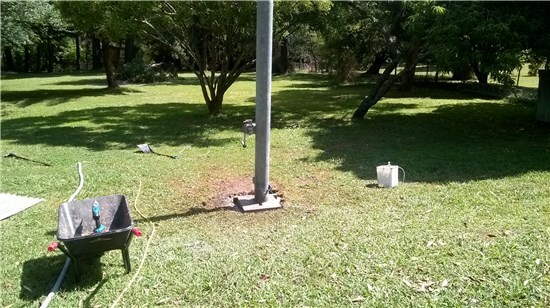 The photograph is taken approximately where the proposed location for the main tower is to be installed. 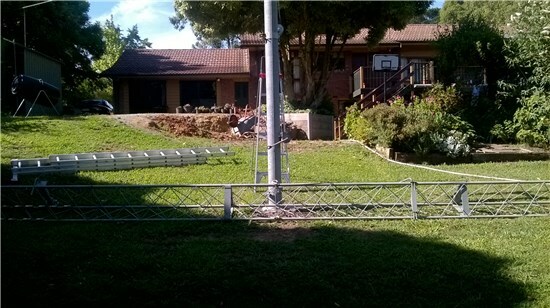 The secondary tower is intended to be located near the shed shown in the photograph, it needs a fair bit of concrete (it is concrete pad mounted) so near the shed provides a good flat area for this. 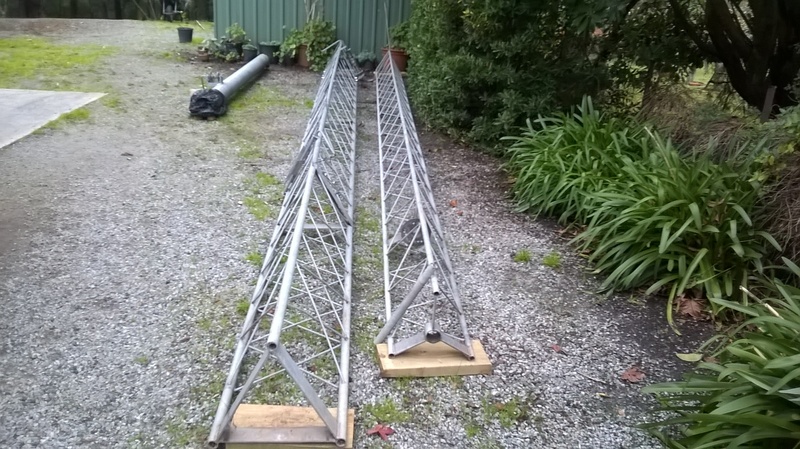 These photographs are of the main tower that I intend to install at this QTH. The photographs were taken when we collected the tower on the 19th of June, 2016. 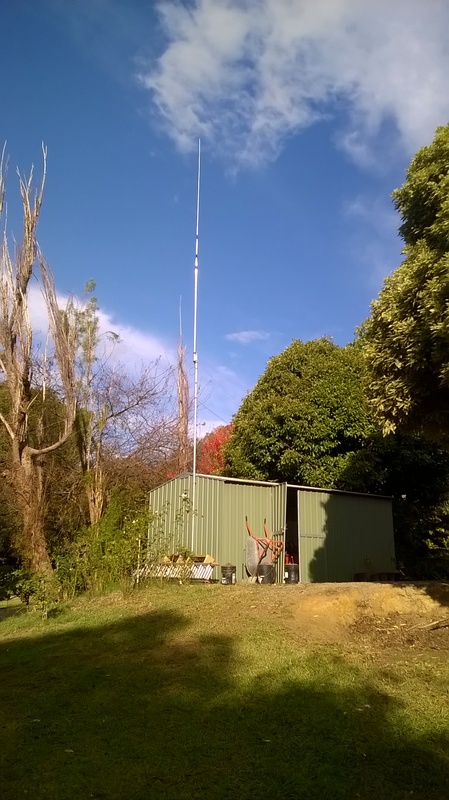 These photographs are of the main Nally tower being installed at this QTH. The photographs were taken during installation on 17th of December, 2016. 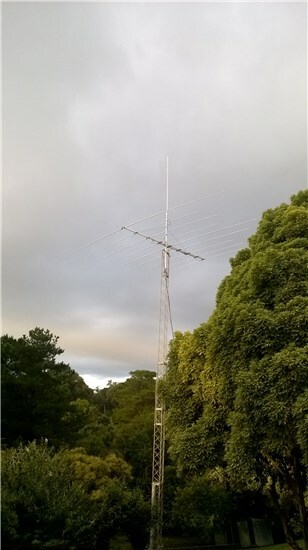 Photographs taken of the main Nally tower being installed at this QTH. The photographs were taken during installation of the first tower section on 05th of January, 2017.